Once you've achieved registration, you must maintain the integrity of the Quality Management System. The most cost-effective, efficient and worry-free way to do this is to have KQMC do the work for you. Our comprehensive ISO Maintenance Support Service Program can be designed to suit the individual needs of your company. Our ISO Maintenance Support Service Program can monitor your Quality Management System to ensure that the system is implemented and maintained. We will report to you the internal quality audit findings along with recommendations. Never be unprepared for another registrar surveillance audit! Our program will have you prepared and confident of your Quality Management System. Our continuous ISO Maintenance Support Service Program is more cost effective than having a full-time employee committed to maintain your system. This is where we can save you money! Documentation Maintenance - The writing of new documents required or the updating of existing documented information as they are modified (Quality Manual, Process Maps, Procedures, Work Instructions and Forms). Internal Quality Audits - It requires manpower resources to maintain your quality system, why not let KQMC's ISO Maintenance Support Service Program help you maintain the integrity of your Quality Management System. We can provide a professional certified QMS Lead Auditor who has many years of experience performing audits for small, medium and large businesses. This can be performed in a cost-effective and efficient manner, which will actually save you money! We can also perform your Internal Audits "as needed" when your organizations internal auditors are unable to maintain the company's audit schedule. Supplier Audits - We can perform assessments for your new and/or problem suppliers or provide "as needed" audit capacity when your organizations is unable to perform an audit. 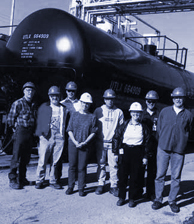 Training - KQMC is a resource for numerous types of on site ISO 9000 training to meet your resource needs. Whatever your training needs are from employee Quality Awareness Introduction to ISO 9001:2015 Internal Auditor Training courses. Our on-site training at your location is a solid investment in the development of your staff and organization. All of the courses are provided with case studies and a comprehensive collection of written material in a student manual for future reference. Contact us with your specific requests and we will do the best we can to create a course that will accommodate your organization. Registrar Audit Support - We can provide valuable on-site audit support and assistance during the third party registrars audits. By having someone that can guide and provide assistance to address interpretations of implementation of the Standard with the auditor. We also provide assistance in developing corrective actions to close out any nonconformance's uncovered as a result of the audit.